Neuronal dendrites contain thousands of synaptic inputs and are the first phase for signal processing. The activation of dendritic voltage dependent currents modulates the amplitude and time course of synaptic inputs, thus when the synaptic potential finally reaches the soma, it is a highly transformed version of the original input. In a previous publication  we simulated the effect of inhibition on the EPSP peak under various conditions of voltage dependent channel activation. 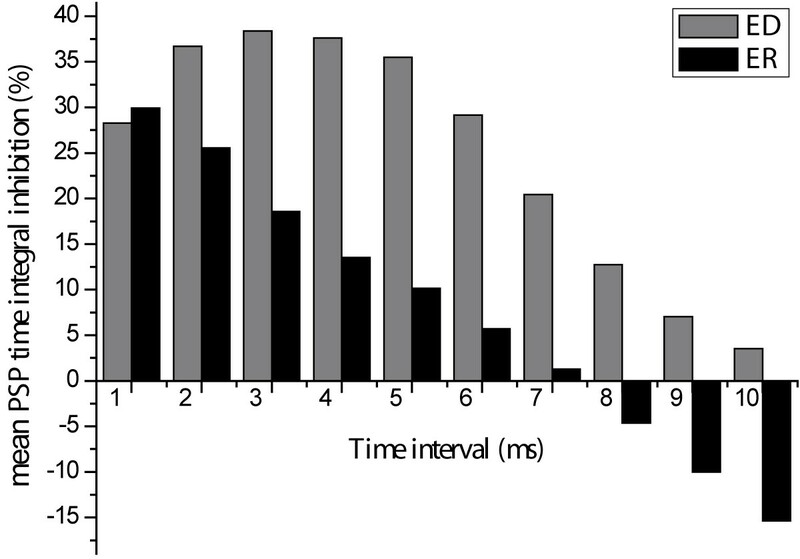 In the present study we analyze the effects of similar conditions on EPSP time integral and its inhibition, since this parameter is also important in determining the firing pattern of a neuron. Modeling of excitation (glutamatergic) and inhibition (glycinergic) of morphologically and physiologically characterized triceps surea MN 43 was executed by a NEURON simulator. Two types of active channel (sodium and potassium) distributions were tested: 1. Exponential decay (ED), where high conductance density, located proximal to the soma, decays exponentially away from the soma, and 2. Exponential rise (ER), where proximal low conductance density increases exponentially with the distance. For each model, out of a total of 11 dendrites, we ran simulations with 2, 4, 6, and 8 active dendrites, while the other dendrites remained passive. In each case, we executed 10 runs of randomly selected dendrites. Densities of the sodium conductance (gNa_step) were varied relative to the type of conductance distribution, between a minimum and a maximum value in order to attain equal total conductance, G (S, Siemens) in order to be able to compare the results of the ER and ED models. In our model, the soma and the axon remained passive and so the impact of dendritic-voltage dependent channels on the EPSP time integral (ETI) and on the efficacy of its depolarizing recurrent inhibition could be distinguished. In all simulations the excitatory synapses were activated after the inhibitory ones at various time intervals. ETI was dependent on the model of voltage dependent channels distribution and the density of the channels (gNa_step). However the effects were in an opposite manner: in the ED model gradually enhancing the gNa_step(and thus G) increased the ETI (in a range of 62–83 mV.ms), whereas in the ER model the inverse relation was observed (in a range of 60-15 mV.ms). When slightly depolarizing inhibition is applied, the averaged inhibition of the PSP (EPSP+IPSP) time integral (PTI) was larger at all time intervals in the ED model than that in the ER model (Fig 1). The relation between the PTI inhibition in the ED and ER models and the gNa_step in single runs was similar to the one described above for ETI; namely large gNa_step increased the PTI inhibition in the ED model while the opposite was observed for the ER model. In the ER model, at large time intervals (no shunt) the depolarizing inhibition even enhanced the PTI relative to the ETI (Fig 1). The mean PTI inhibition (n = 200) as a function of time interval. At all time intervals the inhibition of PTI in the ED model is larger than in the ER model. Note that negative PTI inhibition means excitation (at the 22, 27, 32 ms time intervals). We conclude that the distribution of voltage dependent channels determines the ETI and its inhibition; the ED model being more effective in producing larger inhibition of the PTI. A possible explanation for this result could be the following mechanism: At the synaptic input location the EPSP amplitude is certainly larger than its amplitude near the soma. Therefore, since the ER model contains a high active conductance density near these synaptic boutons, the EPSP was augmented to a pseudo action potential. However in the ED model, amplifying the EPSP proximal to the soma by voltage dependent channels produced a subthreshold response. A subthreshold ETI is significantly less depressed by the active potassium currents than supra-threshold ETI. However, inhibition of the supra-threshold response is less effective than of the sub-threshold response. In sum, the ED model could support larger ETI inhibition.